A Blidworth-based landscaping company is investing in its workforce by offering employees apprenticeships. Ulyett Landscapes has joined forces with Vision Apprentices to offer ten of its staff NVQ Level 2 Apprenticeships in Horticulture. Four existing members of the workforce as well as six new staff will soon be embarking on the apprenticeship which has been specially-tailored to suit individuals’ day jobs and training needs. The company, which was established in 1967, offers commercial and domestic grounds maintenance as well as hard and soft landscaping and arboricultural services across the UK. It also holds grounds maintenance contracts with local councils and schools. Ryan Hunt, 21, from Kirkby-in-Ashfield is one of the apprentices. He said: “To be offered this training is amazing and I’m really looking forward to starting the apprenticeship and achieving a qualification. The apprenticeships are due to commence in June and will last approximately eighteen months and all training and assessment will take place on the work premises. 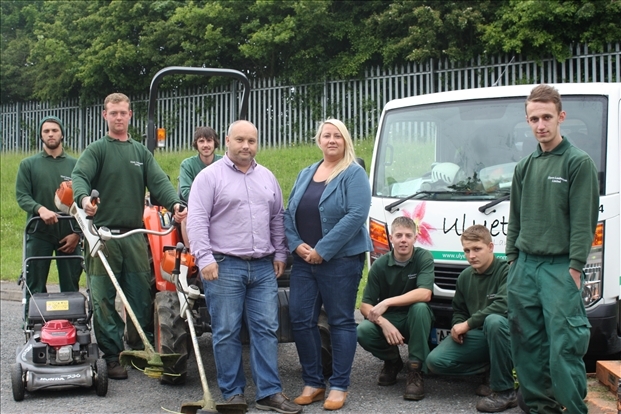 Ulyett Landscapes is owned by managing director Mark Burton. Mark began as a labourer with the company in 1995 and brought the business in 2006 at only 32 years of age. Mark said: “Working with Vision Apprentices is giving us a great opportunity to create apprenticeship programmes that work for the individuals, based on what their daily jobs entail.